Basecamp just keeps getting better. Here are the very latest features and updates. Did you receive this email from us yesterday? Subject: Basecamp 2 security alert: You must set a new password . You’re not alone! You’ve done nothing wrong, and you’re in good company. 1 in 20 Basecamp users got this email alert. Here’s the full story. New in Basecamp: Get less email from Basecamp! When your projects are humming along with a lot of activity (and we hope they are!) you might start receiving lots of email from Basecamp. Sometimes the volume can get overwhelming or repetitive, especially if you keep a close eye on Basecamp throughout the day anyway. Basecamp’s Catch up page is a great way to read about what happened recently in your project, but that’s not the only situation where you need to get caught up. Sometimes you’re invited to a project halfway through, while things are already in progress. Or you might recall something that happened early on, and you’d like to refer back to it. In those cases, it’d be better to start from the beginning of the project and work your way forward in time. 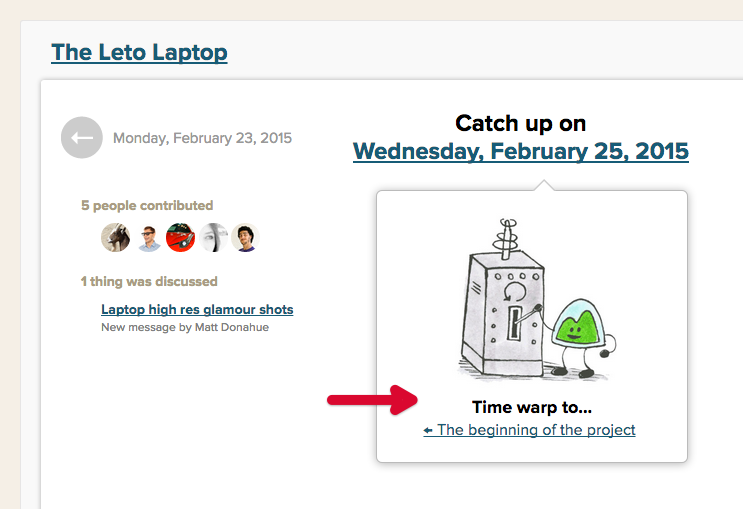 To help you do that, we’ve added a small but useful new option: now you can time warp back to the beginning of a project! Here’s how to do it. Then click on the date link. You’ll see a new option that says Time warp to… the beginning of the project. Click that, and you’ll be transported back to the very first day. From there, you can work your way forward. And you can always transport back to the present by clicking the date again and choosing Time warp to… the last day of the project. Every so often, someone posts several files to Basecamp at once: a set of photos, a few sketches, or a bundle of documents to help kick off a project. You might need to take the files and do something with them, like make changes, email them to someone else, etc. You'll see this link at the bottom of any item that has more than one file attached to it. 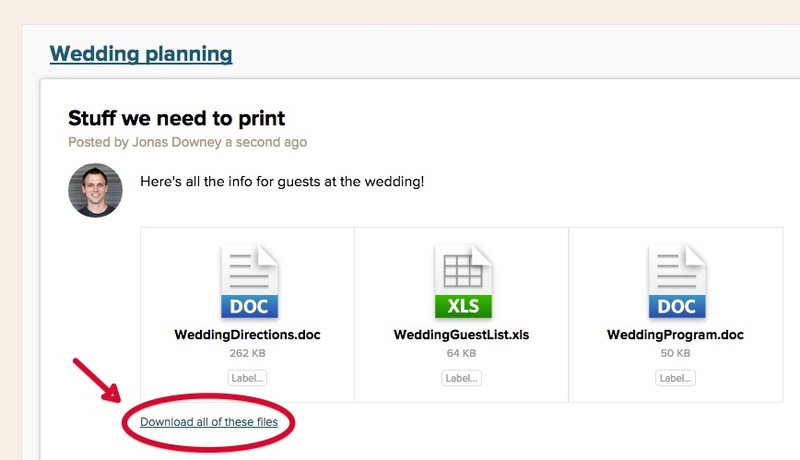 When you click the link, Basecamp will make a zip archive containing those files and download it to your computer. It just takes a second. Give it a try today. Happy downloading! Project Templates are handy when you need to create the same kind of project over and over. Setting up a template in advance helps you avoid repetitive work and saves time. There's only one problem: sometimes you don't realize that a project is worth repeating until it's already in progress! Until now, the only way to make a template was to start it from scratch. That meant that you had to do tedious manual work recreating an existing project. 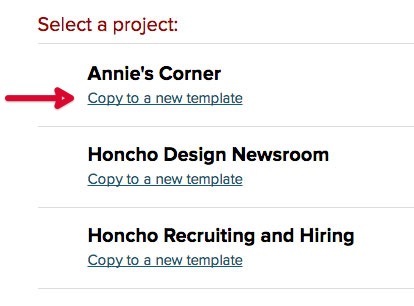 First, head on over to the Project Templates section. Then click Make a template from an existing project. You'll see a new page with a list of all your projects. Scroll down to the project you're looking for and select the Copy to a new template link below. Then make any changes you need (rename the template, delete unnecessary stuff, etc.) Your original project won't be affected at all. We hope this saves some repetitive work and makes templates more useful for you! Basecamp for iPhone 2.0 is here! Today we've got an all new Basecamp for iPhone for you! It’s available now in the App Store, and as always it's free. We decided to finally bring over the great iOS8-inspired design we first introduced this summer on Basecamp for iPad. Every screen has been re-thought, re-designed, and polished with improved navigation, and a fluid layout that adapts to every iPhone out there. To-dos. Drag them. Reorder them. Check them off. Assign them. Pick a due date. Get stuff done! Search. 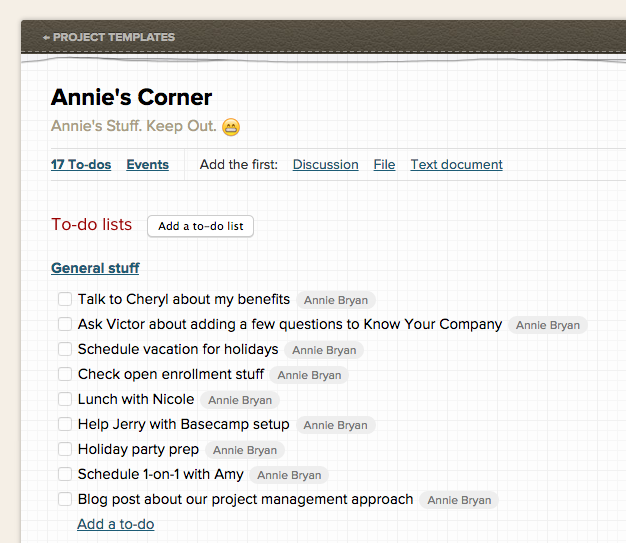 Jump to a project or person easily or find that thing that's in Basecamp. Make Projects. Right from your phone, get started right with a new project in Basecamp. Today Widget. Get a glance at your to-dos and calendar events from your iPhone's Today screen. Share extension. Post a sketch from apps like Paper in Basecamp. Copy that link from Safari into Basecamp. Put it in Basecamp! Handoff. 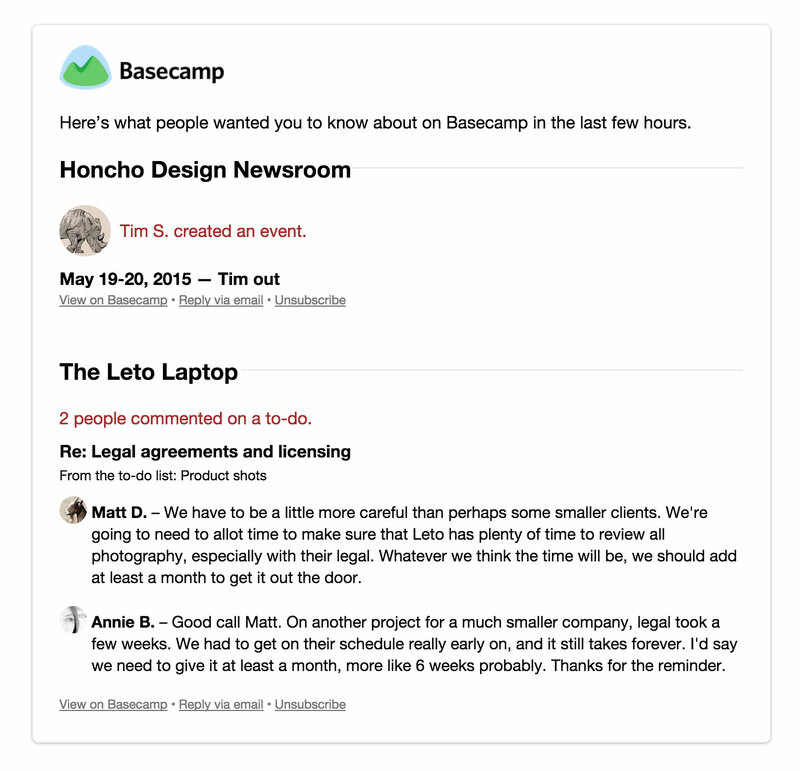 Looking at Basecamp on your Mac or iPad? Pop open your iPhone and pick up right where you left off. 1Password. Users of AgileBits' excellent password manager can now sign-in to Basecamp on iOS. With this update we’ve unified the experience and features on Basecamp for iPhone and iPad. Long term that means new features will arrive on both platforms simultaneously and the unified codebase means we can make improvements faster than ever before. And it works both ways! Basecamp for iPhone gets all the iOS 8 goodies from iPad in this release and Basecamp for iPad now has support for Basecamp Classic accounts (which was previously only available on iPhone). To get all the new goodies make sure your iPhone or iPad is on iOS 8, then head on over to the App Store, it’s free!